What a beautiful wedding day for Kindra + Roger! Arriving at the rustic and quite adorable Longstraw Farms in Ayden, NC was such a treat. Sandy, the owner of the farm is such a delight and made this the perfect venue. As soon as you walk up, you are welcomed by the hand calligraphy signs. The ceremony spot under the grandfather oaks are filled with restored vintage church pews. Walking in a bit further, is Roger’s very own classic 1973 Volkswagen Beetle. This vintage themed classic couple make me swoon. Even the bride wore pearls from her great grandmother, which were purchased in Japan by her great grandfather. I knew right away that this was going to be a day to remember. This sweet couple were a joy. Let’s take a look at their love story. Roger’s sister in law, was Kindra’s roommate in college, were they eventually met. They quickly became best friends from the start, where they were friends for a long time before deciding to date. Kindra fell in love with Roger before she even realized it. It took her by sweet surprise. Roger asked Kindra to marry him at a Capital Cities/ Bear Hands concert . Yes! was her immediate answer of course. After over a year of being engaged they are now here at the beautiful farm to become husband & wife with a farm full of loving witnesses. This memorable day full of dancing, laughter and funny toasts made for such the celebration. 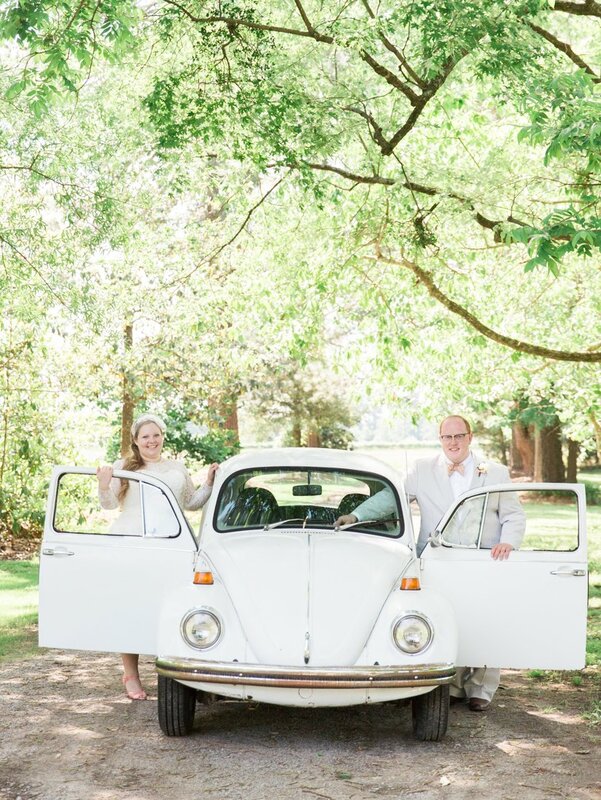 Ending this perfect day was a firework exit and driving off into the sunset in the grooms classic Volkswagen. Enjoy the gallery where as they say, pictures are worth 1,000 words. I am convinced that a Southern wedding is like none other. There was so much charm from the venue of this Chapel Hill wedding to the old Southern traditions. 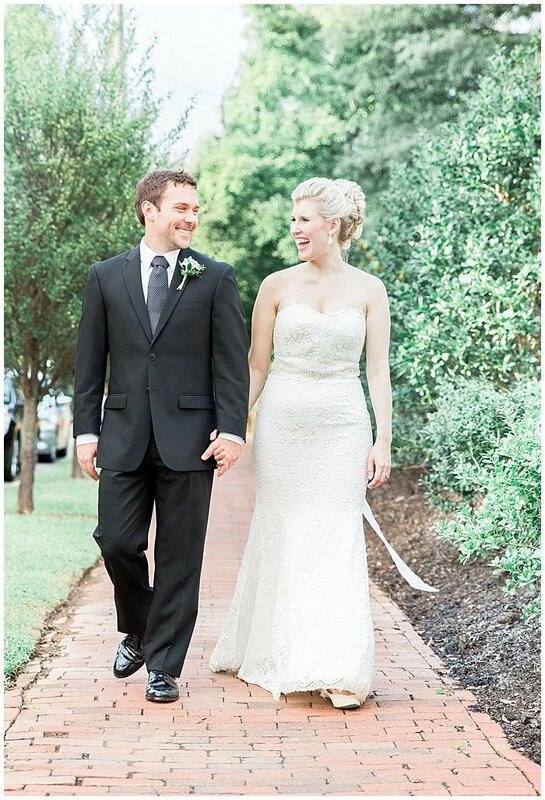 This North Carolina wedding at the cozy & private Bingham Inn made for such a romantic celebration. Southern tradition at it’s best complete with a party bus, pig pickin’, monogrammed corn hole and diggin’ the bourbon to name a few. 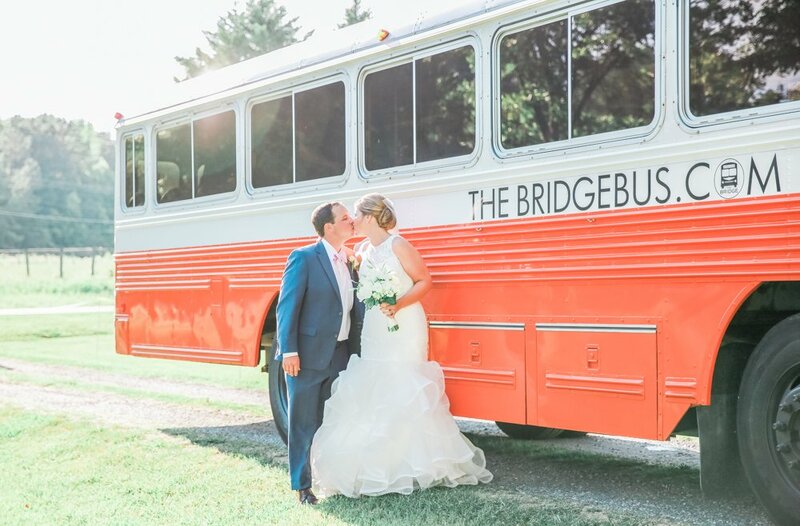 The just married couple loaded up the wedding party in the fun Bridge Bus and headed over to the reception. Time to party! When the bride, Ashley tells me get ready for diggin’ up the bourbon, I was stumped. Come to find out it’s an old Southern tradition and I think this one falls under the heading of “crazy traditions,”. My research was inconclusive as to where this tradition began, though some sources said Virginia, and some Tennessee. Regardless of the location, Southern folklore says that if you bury a bottle of bourbon at the site where the bride and groom are to be married, then it won’t rain on their wedding day. According to many believers, this must be done exactly one month before the wedding, the bottle must be completely full and it must be buried upside down in order for it to keep the rain away. It must work because it kept the rain away and we had a day full of clear skies. The night was complete with an emotional speech from maid of honor and sister and the night full of dancing and celebrating. Traditional North Carolina Wedding at it’s finest. Such an honor to have Huff Post feature the dreamy moment of Ashley & Andrew swinging from the magnificent grandfather oak. This was such a proud and gorgeous moment to capture. Thank you Huff Post! The historic Merrimon-Wynne House, built in 1876, in downtown Raleigh is such a beautiful piece of southern history. The mint colored walls and chandeliers make for the perfect backdrop! I don’t know who was more excited me or the bride, Mary Cates! I “ooh and ahhed” at every elegant detail. Mary Cates, is such a gorgeous southern belle and sweet to top it off. It was trult a delight to be part of her special day! Jason her handsome groom was also just as sweet and endearing. They make for such a perfect match. One of the highlights of the day included the officiant, stopping mid ceremony to remind the guests to shout”all in favor” for all to hear. He was a ball of laughs. Then there were those tender moments of the first dances with father & daughter, mother & son. I look forward to being part of capturing future memories. Mary Cates is already talking baby photos ha! I wish the wonderful newlyweds a lifetime of joy!